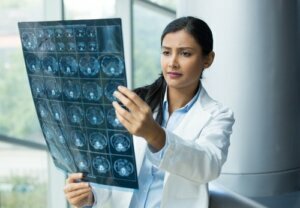 Closeup portrait of intellectual woman healthcare personnel with white labcoat, looking at full body x-ray radiographic image, ct scan, mri, isolated hospital clinic background. Radiology department. Photo courtesy of Shutterstock.